I’m seated at that northern end on a bench near one of those cafes. It is lovely, peaceful, and an ideal place to sit and rest. “Envisager” (ahn-vees’-ah-jhay) – to contemplate. A tai chi class has just finished near the center garden. They capture perfectly the atmosphere of serenity which envelops me in this special place. A central fountain draws visitors to sit, and have a picnic and a bottle of wine. There are other gardens in Paris which I favor more than this one. For me, I could come to Paris just for the opportunity to walk through and admire the Jardin des Tuileries. But, I am charmed by the Jardin du Palais-Royal, by its hiddenness, the secret of it. It is very similar to the discovery of Place des Vosges in the Marais. I am struck by the thought, “How wonderful it would be to share this secret garden with a child.” Would that I might one day whisper in a little ear – perhaps after a big visit to the Louvre or the Eiffel Tower or after a boat ride down the Seine – “Now, I have someplace very special to show you. Believe it or not, very close to where we are now, even with all the people and noise around, there is a quiet place, a pretty place, a secret garden. Would you like to see it?” And, the child’s eyes would light-up and a smile of anticipation would transform his or her face. And, then I would show that special child the way to the Jardin du Palais-Royal. I am enjoying discovering – and rediscovering – this the 1st (1er – “prem-ee-ay”-for “premier”) Arrondissement very much. I am enjoying discovering quiet Paris courtyards and gardens in the midst of the fray that is Paris. Encountering this “secret” garden was a delight. 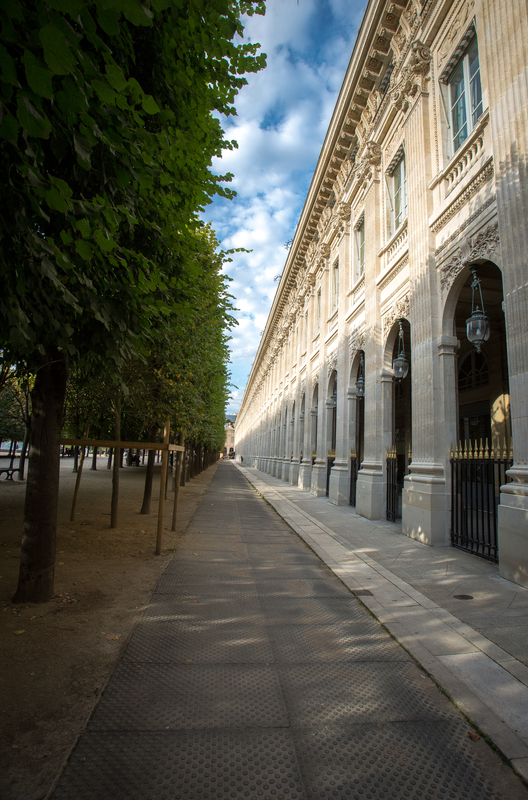 Jardin du Palais-Royal – the only remarkable garden in Paris? This entry was posted in Daily Post Writing and Photography Prompts, Europe - August 2014, Paris, Travel Photos and tagged 1er Arrondissement, Cour d'Honneur, Jardin du Palais-Royal, Les Deux Plateaux, Paris, public garden. Bookmark the permalink. Thanks for the link to my blog. It’s good to see the jardin du Palais-Royal looking so good recently (I assume these pictures are from last summer?). It had become very shabby when I was living in Paris, but that’s three years ago now. Shame you don’t like the Buren columns in the court d’honneur; I think your ‘special child’ visitor would enjoy them: our daughter used to leapfrog over the smaller ones and wobble precariously for photos standing on the taller ones!